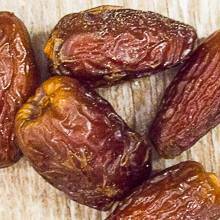 These Medjool dates make a perfect treat. They are high in fiber and natural sugars. Eating Medjool dates helps promote healthy living and gives you a sustained energy burst that can't be beat. Dice them over your morning cereal or yogurt, or sprinkle them over your favorite salad for lunch, or mix them into a smoothie. You will enjoy the amazing health benefits of this delicious dried fruit!